Even as a very little girl, I had always loved to draw and paint. 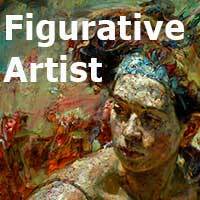 I started taking art lessons at the Edmonton Art Gallery, my hometown, when I was 7 and continued with the Gallery every winter into my teens. In 1959, when I was 11, we went to Scotland and England for 6 weeks to visit with my grandparents.. I had a sketchbook and did little drawings in pencil and conte crayon. 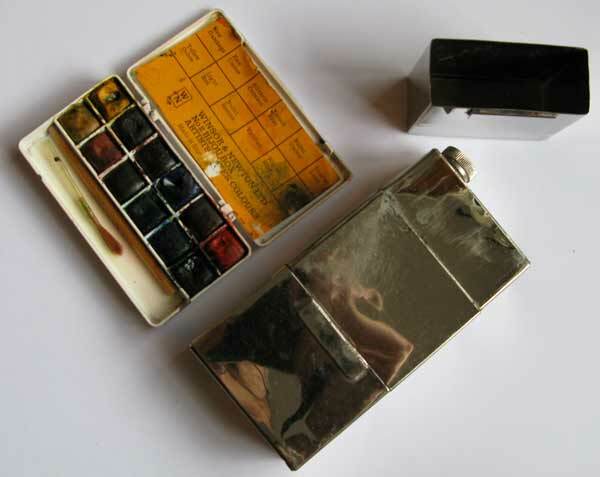 One afternoon while in London, my father disappeared for the afternoon and came back with a tiny paintbox from Winsor and Newton, and a little metal water flask with two slip-off ends to hold the water. These two pieces have been with me throughout the years; through moves to several apartments while I was still single, and then out to Vancouver when I got married 37 years ago. There have been periods when they were frequently used, and long periods when they were tucked away. Sometimes the reasons were positive – I concentrated on building and enjoying my career as a commercial interior designer, Drawing all day at work, I didn’t feel the need to draw for pleasure. Photography and writing interested me more. At other times the little paint kit sat on a shelf for rather sad reasons – I had unsuccessful eye surgery, and could only draw effectively on a computer – my eye/hand co-ordination had been damaged when I tried to freehand anything whether for work or as a pastime. About two years ago,my vision was re-tested and I went to a new optician. My new glasses were a perfect fit and I sensed my vision was clearer than it had been in years. I began to do a little drawing again but only intermittently. 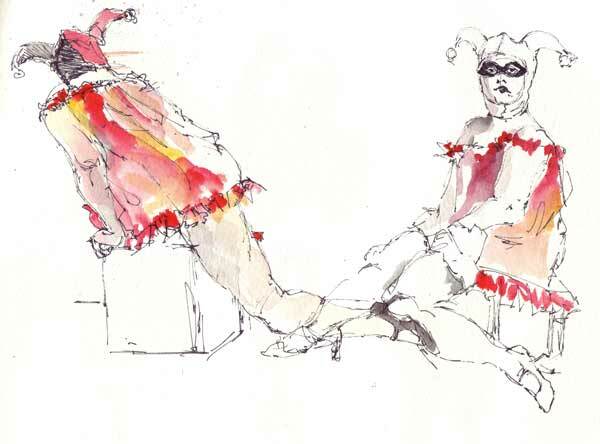 In September 2013, I plucked up my courage and joined Urban Sketchers Vancouver. 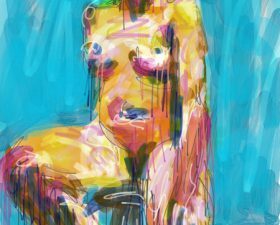 I thought if I am going to draw again, and progress in any way, it must be on a regular basis and in the company of others. I noticed at my first meet-up, that most people were using small Moleskine sketchbooks that they tucked into a pocket, a handbag, or a flap on a packsack along with coloured pencils, inks, or small paintboxes. What could I use? 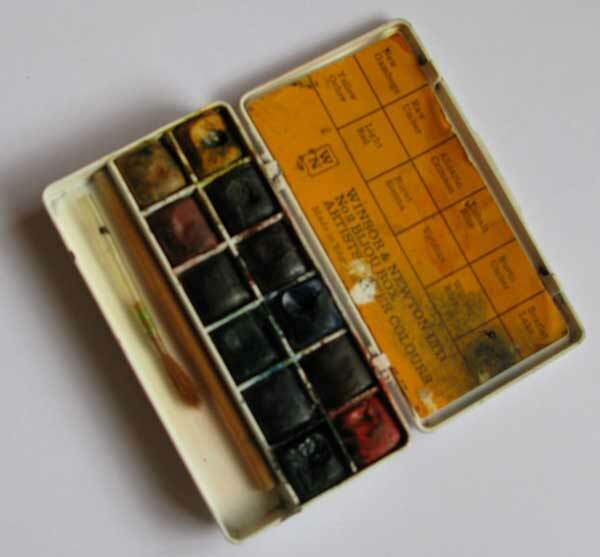 I remembered the little paint box – would the colour still be usable? The little kit is just 1 3/4″ wide x 3″ long. The colours are the professional quality W&N, and when the wet brush touched the first pan, the colour was as fresh and vibrant as ever! So now, 55 years later!! – the box is always with me and used almost daily. 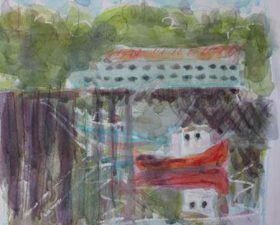 Catherine Youngren Interior Designers Inc.
Now I am retired and I have come back to watercolor. 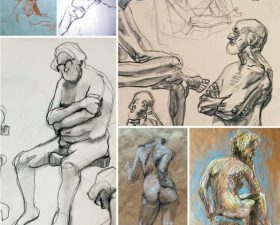 I started with free classes from the community college last September. I started with the paint set my Grandfather gave me. The colors are still as good as the day he bought it for me and I am comfortable with it. But I have put it aside for more professional grade paints, brushes and paper. Now I am on the hunt for a bijou box like yours. I like to work small and have bought some Pentel watercolor journals to use but am still trying to find that comfortable bijou box to take with me. I’ve made one from the Whisky Painter’s and I have a vintage George Rowney that I will be using until I can find that Winsor and Newton. But I will occasionally pull out that Pelikan box to paint for my own pleasure. You cannot replace the memories that come with the act of using it. I’m sure you experience the same thing when you use your little Bijou. Thanks for sharing. I’m happy you are painting again. Thanks so much for sharing your memories with us. Yes, lots of memories inside each box. Good luck on the new/old journey! !